Shadajah Ballard is a senior with Western Branch High School in Chesapeake, Virginia. 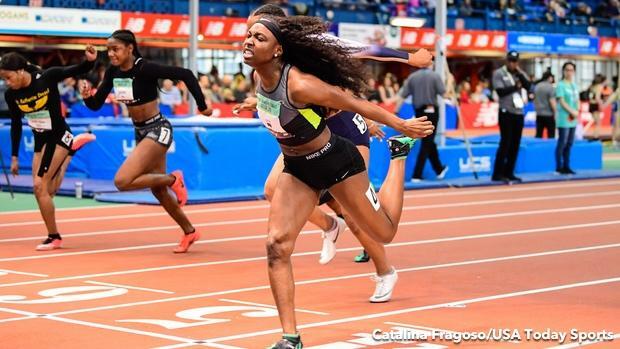 She's headed to her final outdoor track and field season with the Bruins and wrote a letter to running for MileSplit, sharing how certain moments have shaped her. You've taught me a lot of things over the years. You have inspired me to be a better person and athlete. You've taught me that with hard work and patience, I can accomplish anything. And although I have gone through many trials and tribulations, I know you've taught me about perseverance, too. I came out that storm with many blessings. As a child, I could never see myself as a runner, but I remember days with my sister Na'Taja Ballard on back roads, sprinting barefoot, and I was inspired to try it out. My stepdad, Omar Holloman, introduced me to track and field. My first year was AAU. I made it to the Junior Olympics in New Orleans when I was 10 years old. I didn't know how to run, I had no form, just speed. I came in last place in everything, and at the time, it was the biggest disappointment of my life. That's how my relationship started with you, so from there I never expected to accomplish the things I have done. Next came middle school. I attended Jolliff. And this is where it all changed, the time period where I loved you. Everything was going well, I was winning all my races, and I had no injuries while practicing and competing on a concrete track! I don't know how, but I was injury free. I appreciate you for that! During my eighth grade year, I met one of the greatest coaches of all time, Claude Toukene. It was at my city meet and I heard he was coming to watch me. Knowing that he came to see me and only me, I just knew in my head that I had to show out. The first thing he said to me was "Hi, my name is Coach Toukene, nice to meet you." At first, I couldn't understand anything he said because of his accent--Touks was born in Yaounde, the capital of Cameroon, and he grew up speaking French. I was confused on why he would say nice to meet him, so I laughed and began to introduce myself. But that day was huge. Because before I met Coach Toukene, I didn't know anything about track. Before that, I would just run when my coaches told me too. It was just another thing to do. And then Touks told me there was more to track and field than just running. Only until later did I start to understand that. But he helped me understand the science and physiology behind it all. When high school arrived, I had many hiccups early on. I got a concussion at my first track meet. I was warming up for the hurdles and Kevonte Dawson did an acceleration on the curve and ran into me. We both flew backwards, and I hit my head on the floor. I was out for two weeks, but I recovered and went back to training like nothing happen. I thought nothing could stop me. Then came my hamstring injury. This was sophomore year, and everything was going well for me indoor. I set a few records, many PRs, etc ... and then outdoor came, and another set back occurred at The Penn Relays. I was warming for the 4x1 and my hamstring felt tight. I didn't say anything because I knew my team needed me. We walked on the track, I was feeling OK, not worrying too much about my hamstring. Then the gun went off. Jessica Tucker was the lead-off. She was coming in fast and handed off the baton and I start to run. I felt my hamstring tightening up, but I kept running. I handed off to Inayah Boone, who then handed it to Dajah Parker-Love. We made The Championships of America Final. I was so excited, but I was sad because I knew I won't be able to compete. The girls still went out and competed. 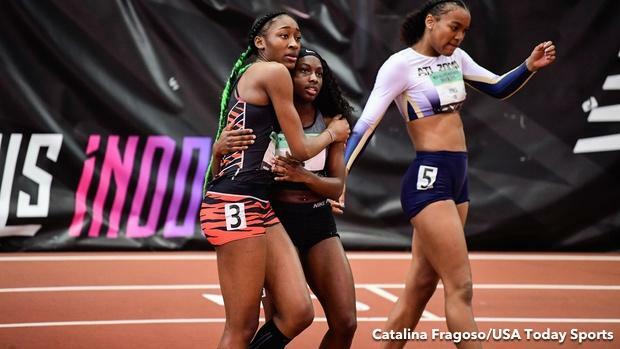 Jada Terrell took my place and the team still ran the same time as prelims without me. I was out for three weeks, but afterward, I had plenty of rehab and rest and I came back feeling stronger than ever. I found out that one of the best people in my life, Coach Touks, would soon leave that year for a college job. When I found out he was leaving Western Branch I was distraught, filled with emotions, but it didn't hit me until outdoor states. I had to work harder and become the best I could that year so Touks could leave with a bang! So when outdoor nationals came, we showed out and we brought home nationals records and titles. I placed third in the 100 meter hurdles, and things were going well. But three days after outdoor nationals, I got admitted into the hospital. I had sharp lower back pains and loss of appetite, which resulted me being rushed into the emergency room. The doctors told me I had a cancerous mass in my kidney. I busted into tears just knowing track and my life was over. I stayed in the hospital for a week, ready to give up track and leave everything behind. But after the doctors ran more test, they found out that it wasn't cancer just an infected cyst, and that with antibiotics and rest I would be back. Looking back, that's kind of crazy. But you have to persevere. And all I did was look ahead. Senior year, things went great. I had one of the best years I've ever had on the track. I set state records in the 55mH and 60mH and I was the first female from Virginia to win the 60mH national title!!! There were many hiccups, but maybe that's life, and sometimes it's track, and in the end I still love this sport and I thank you, Running, for getting me where I am today. Next up, the University of Kentucky in the fall.